Amylulita says...: Aug 25th I'm hosting the official STEREO TOTAL after-party! Aug 25th I'm hosting the official STEREO TOTAL after-party! 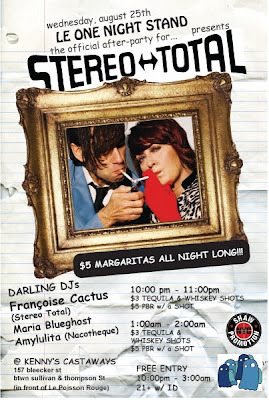 NEW YORK, NY – On Wed, Aug 25th Le One Night Stand presents the official after-party for the delectable duo from Berlin STEREO TOTAL @ one of the last remaining authentic rock 'n' roll bars in New York City; Kenny’s Castaways (the band is headlining at Le Poisson Rouge the same night. Les Sans Culottes will be opening). 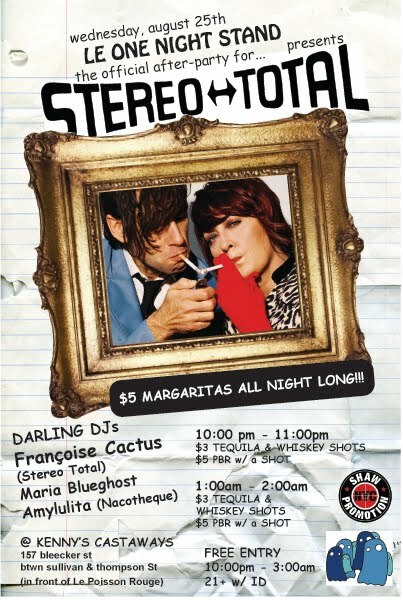 In the DJ booth will be Stereo Total’s front woman Francoise Cactus along w/ DJs Amylulita & Maria Blueghost spinning an eclectic selection of French rock n’ roll, Euro-Garage, Brazilian post-punk, German new wave, Spanish 80's and Italo Disco. In addition, there will be a special burlesque performance at midnight! The drink specials will tempt anyone with a thirst; $5 MARGARITAS ALL NIGHT LONG + 10:00 pm - 11:00pm - $3 TEQUILA & WHISKEY SHOTS + $5 PBR w/ a SHOT & 1:00am - 2:00am - $3 TEQUILA & WHISKEY SHOTS + $5 PBR w/ a SHOT. How can you beat that?? $5 MARGARITAS ALL NIGHT LONG!!! 40% Yéyétronic, 20% R'n'R, 10% Punkrock, 3% electronic effects, 4% French 60ies beat, 7% genious dilettantism, 1,5% Cosmonaute, 10% really old synthesizers, 10% 8-bit Amiga-sampling, 10% transistor amplifier, 1% really expansive and advanced instruments, a minimalist production, meaning a home- made- trash- garage- sound crossed with underground, authentic as well as amateurish, ironic as well as effective, pop as well as political. STEREO TOTAL released a vinyl 7" on Elefant Records in Spain called "Plástico" [features a spanish version of the song "Plastic" and three coverversions of Spanish songs] and a special Stereo Total- best-of: "Grandes Èxitos" will soon be out on Silicon Carne Records in Mexico. LE ONE NIGHT STAND parties were an extraordinary experience in 2005 – 2007 where producers Amylu Meneses, Andy Shaw, Sheila B, and Melody Nelson introduced NYC to the best pop and rock n' roll sung in foreign languages ranging from europop, electropop, eighties, nu wave italo disco, yé-yé, bubblegum, sixties, jpop, and swedish pop. LONS had the privilege to work with; Saint Etiene, Puffy Amiyumi, Bob Stanley, Nouvelle Vague, Timo Ellis (Cibo Matto), Nous Non Plus, Les Handclaps, Josh Styles, Peppermintwist, Jaiko Suzuki, and many more. Experience the heart of Rock and Roll in the legendary heart of Greenwich Village. SInce 1967, Kenny's Castaways has been the house that Rock built. Bruce Springsteen played his very first New York gig here. The New York Dolls, Patti Smith, Aerosmith, Rod Stewart and the Ramones are all part of Kenny's history. One of the last remaining authentic rock 'n' roll bars in New York City, Kenny's Castaways is your destination for real music, raw energy, and rockin' good times.